Cold (low level) laser therapy is here! Treat all of your furry, feathered, scaly, or shell covered friends without painful procedures or the possible side effects of prescription drugs. Low level, or cold, laser therapy, a trusted technology approved by the FDA, has been proven in humans to treat chronic neck and shoulder pain, acne, and post surgical pain and inflammation, to name a few. Now this same treatment modality is available for your animals to promote bone, tendon or ligament repair, wound healing, reduce inflammation, and stimulate regeneration of all types of cells. When these cells are targeted via light, then special molecules are released that support increased circulation, collagen synthesis, mineralization, skin cell or nerve tissue regeneration, and reduction of scar tissue. The light causes energy production within the cells, which is necessary to cause the changes and positive reactions listed above. When conditions involve pain and inflammation , some animals may still need to be on a non-steroidal anti-inflammatory drug (NSAID) or other pain medication. The cold laser therapy is a great first step to reduce inflammation because it bypasses the digestive system, eliminating the possible side effect(s) of NSAIDs (or other drugs) like vomiting, diarrhea, and elevation of liver enzymes. Cold laser therapy not only suppresses the inflammation but stimulates cells to repair and regenerate, providing an environment for healing. Although the list below does not begin to cover all of the therapeutic uses, it does give you an idea of all of the problems that can be treated. Consult with us today about a therapy program tailored to your pet’s specific needs! 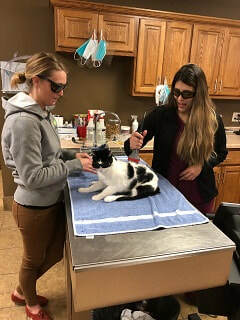 Dr. Amber Gooden and Alicia, CVT performing cold laser therapy to Frankenstein.